LARGO, MARYLAND, UNITED STATES, January 16th, 2018 /EINPresswire.com/ — cFocus Software announces the January Installment of the Washington DC Bots and Chatbots Meetup Founded September 29, 2017, the monthly meetup is designed to engage developers, government agencies, businesses, and technology enthusiasts in discussions, demonstrations, and collaboration around the latest bot & chatbot-related trends and technology. 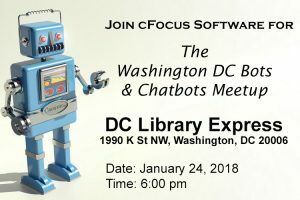 The January installment of the Washington DC Bots and Chatbots Meetup is scheduled for January 24th, 2018. Event Description: Would you like to create a bot that can answer the phone resolve issues at a call center? Join us as we walk through the process of creating a voicebot with Amazon Lex (the same technology used in Alexa) and integrate our voicebot with an Amazon Connect call center system.